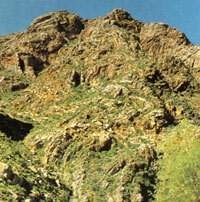 Geologically the area covered by the Klein Karoo can be divided into three principal rock types. The lower layer, known as the Malmesbury Shales, consists of mud sediments that were deposited under the sea. Between 610 and 500 million years ago great volcanic activity caused magma to break through to the surface, covering and intruding into the Malmesbury Shales. As the magma cooled and solidified the Cape Granites were formed. The region then rose gradually above the surface of the sea and for 50 million years erosion and weathering created a level plain. Once again the land mass sank and was covered by a shallow sea for some 200 million years. During this time marine and land-origin sediments were laid down on top of the sunken plain, in places to great depths, to ultimately form the group collectively known to us the Table Mountain Series. These sandstones consolidated to form weather-resistant rock and once again the region rose above sea level. As this process was taking place the earth's crust was subjected to massive folding and tilting and the mountain ranges we know as the Cape Folded Belt came into being. These ranges have changed little, in contrast with the coastal plain which has been influenced by sea level fluctuations and the processes that were put into play by these events. Most of the soils in the mountainous areas are highly leached and acidic, whereas those in the valleys and on the lowland plains tend to be more fertile. South Africa has the longest wine route in the world, the R62 wine route.